“Used to wonder if you understood the way I felt about the stove.” What the hell does that even mean? Why is “Stove” one of the best Eric’s Trip songs, and yet, it’s about… a stove? In 2001, Eric’s Trip reunited and toured Canada. They played in Toronto at the Opera House, and it was my first visit to that venue, and to Riverdale. It was an incredible show. 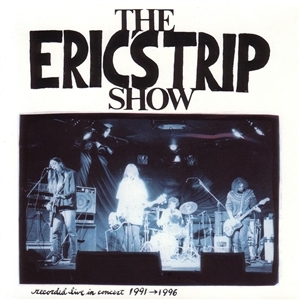 The Eric’s Trip Show was a compilation album of live performances by Eric’s Trip to coincide with that tour. I purchased this record at the show. “Sorry we’re so sloppy,” exclaims Eric’s Trip bassist Julie Doiron. Doiron who has gone on to have an incredible solo career is just as adorably awkward in his Eric’s Trip banter as she is today. It’s the sloppy, though, that brings many into the Eric’s Trip fold. The noise and lo-fi sound are a huge part of the Eric’s Trip sound. This record truly captures that. I’m not a big fan of live records and as such rarely return to this CD, but there are some true highlights on this album. “Happens All The Time,” “Frame,” “Smother” are amongst the best tracks on this CD. “My Bed Is Red” is not a song I’m generally a big fan of, however, the performance on this album is just absolutely amazing. The guitar is killer, but my lord, the Mark Gaudet’s drumming is unbelievable. One of the weakest parts of this album is that it’s live recordings, and personally, I’m not a big fan of live records. There’s also a handful of songs that never spoke to me, and honestly I find boring, “Smoke,” “Beach,” “Near Here,” and “Sloan Song” are all just filler in my mind.